Figure 1: Survey map showing stations generated for 1217S: Red stratum = 0-150 m depth, green stratum = 150-200 m, blue stratum = 200-250 m and light-blue stratum = 250-350 m. Boxes/polygons represent restricted or closed areas. Closed circles = primary haul positions, open circles = secondary haul positions. 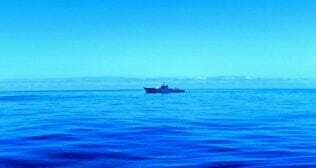 To undertake the bottom trawl survey of haddock on Rockall Bank to a depth of 350 m.
To deploy a CTD at selected trawl stations to collect temperature and salinity profiles. 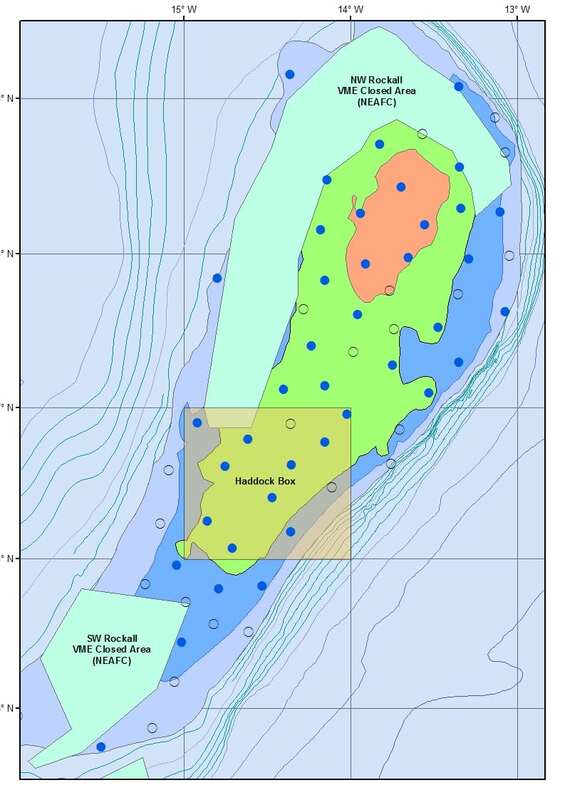 The primary objective of this survey is to assess the state of the haddock stock on the Rockall Plateau. The survey employs a semi random stratified design, comprising four sampling strata separated according to depth. Sampling intensity within each of the four strata reflects the fish density observed in each of these during previous surveys. Trawling will be carried out during the hours of daylight at randomly selected locations within the 350 m contour. Forty primary tow positions have been generated and their allocation within each depth stratum is displayed in Figure 1. The number of stations within each depth strata is as follows: five stations at 0-150 m, 21 stations at 150-200 m, 10 stations at 200-250 m and four stations at 250-350 m. Scotia will undertake a haul within five miles of each station where possible or, failing that, choose an alternative. A further 22 secondary stations across the various strata have been generated to provide a source of additional stations and/or alternatives should any primary station prove unfishable. Where time allows additional hauls will be conducted outside our strata (at depth below 350 m). One haul of 30 minutes duration will be made at each sampling station. Daily start times for survey stations will be at approximately 06:00 hours and continue until approximately 20:00 hours. The Scanmar system will be used to monitor wing spread, door spread and distance covered during each haul. A bottom contact sensor will be mounted on the footrope to record the distance of the trawl off the seabed. Catches will be worked up according to the protocols for International Bottom Trawl Surveys. A CTD will be deployed at selected trawl stations.